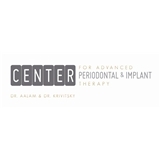 CENTER for Advanced Periodontal & Implant Therapy (Los Angeles) - Book Appointment Online! At the CENTER for Advanced Periodontal & Implant Therapy we are proud to offer the most innovative care from the only two board-certified periodontists in the Brentwood area. Dr. Alexandre Aalam and Dr. Alina Krivitsky both utilize the latest technology to give patients life changing results. Brentwood periodontists Dr. Alexandre Aalam and Dr. Alina Krivitsky are both professors at USC School of Dentistry and experts in a number of periodontist therapy including gum treatments and dental implants. Our office offers a safe and relaxing environment to ensure you receive a personalized and accurate diagnosis and treatment. We keep a strong relationship with your dentist and physicians to ensure you receive the most optimal patient care. Drs. Aalam and Krivitsky are proud to offer personalized diagnosis, caring, expert and painless periodontal treatment. I am so glad to see the office has grown but the high standard has been maintained. Alina is an asset infact everyone I have met has been very friendly, professional & kind.